Progressive companies and investors are making public commitments to respect community rights in their operations, but implementation of commitments has been uneven and opaque. Demand for land is intensifying, but little has yet been done to implement commitments, and local peoples continue to be marginalized in the face of growing threats. In its effort to develop broader collaboration and commitment by companies and financial institutions to prioritize recognition of community lands, Rights and Resources Initiative has played a role in the development of a series of new tools and alternatives, aimed at leveraging and influencing the private sector—one of the most powerful stakeholders in the forested areas of the developing world—to support secure community land rights. Learn more about the Interlaken Group, which gathers representatives from leading companies, investors, and NGOs jointly committed to addressing this issue. 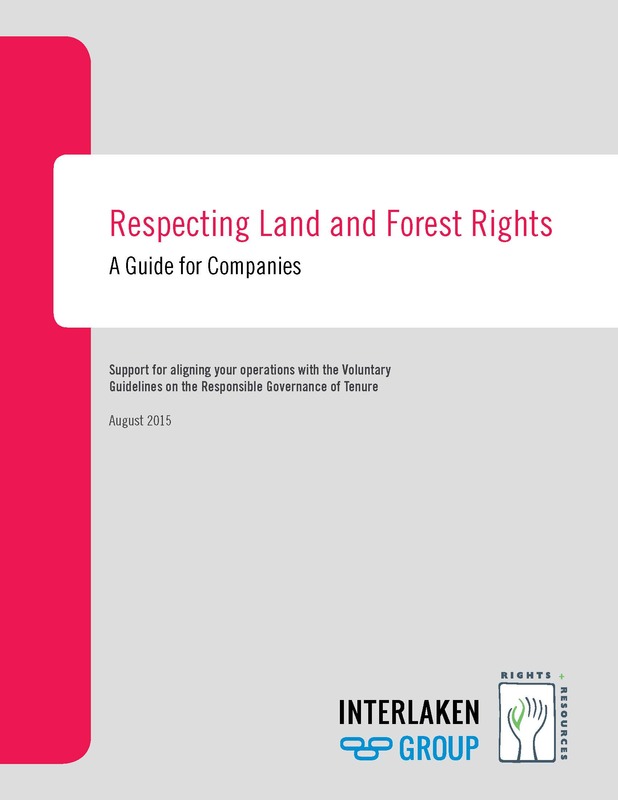 Respecting Land and Forest Rights – An Interactive Guide: A new guide produced by the Interlaken Group that offers support for companies seeking to align their operations with the Voluntary Guidelines on the Governance of Tenure. The LandMark Map: Spearheaded by RRI and 12 other organizations, LandMark is the world’s first interactive global platform to provide maps and other critical information on lands that are collectively held and used by Indigenous Peoples and local communities. IAN products: Two tools which draw on geospatial data to help investors identify and manage tenure risk; enhance environmental, social, and governance (ESG) diligence; and engage local people in land and natural resource deals. IAN: Risk is a quantitative assessment tool designed to give investors a quick, easy means of identifying and approximating tenure risk. IAN: Diligence provides sector‐specific and step‐by‐step guidance on how to negotiate tenure risk throughout the project lifecycle in agriculture, mining, and hydropower projects. 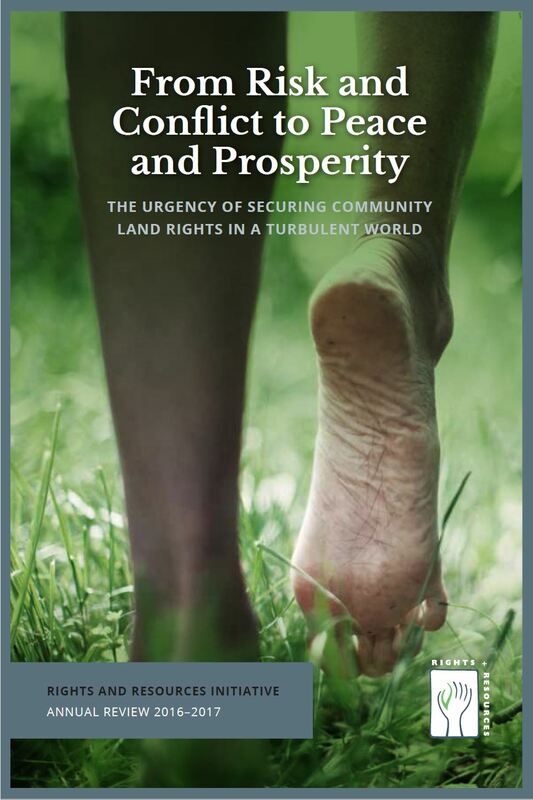 Amid the realities of major political turbulence, there was growing recognition in 2016 that community land rights are key to ensuring peace and prosperity, economic development, sound investment, and climate change mitigation and adaptation. 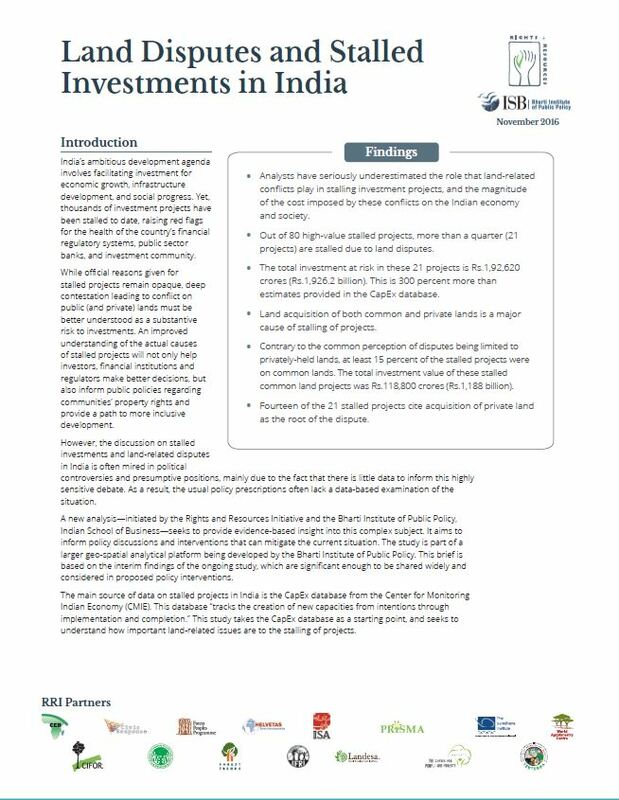 This analysis seeks to provide evidence-based insight into the thousands of investment projects stalled to date in India. 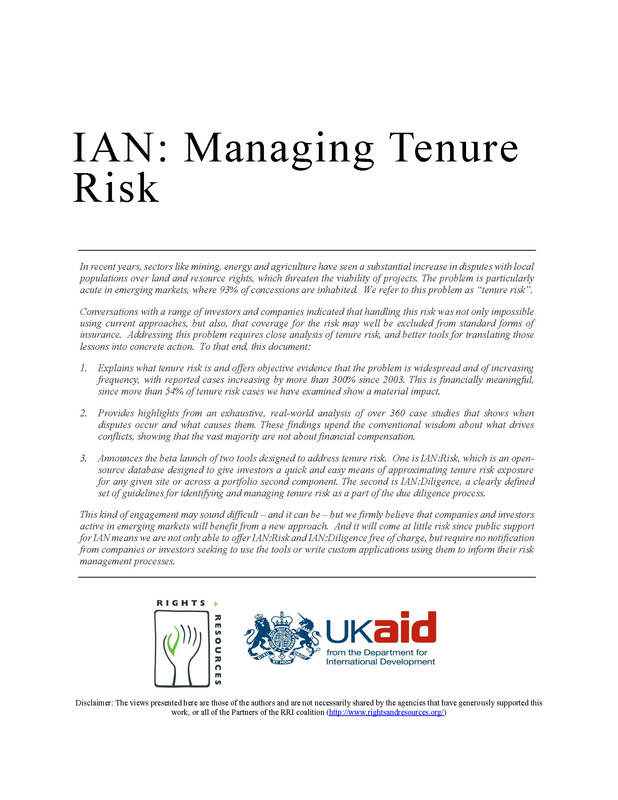 This report explains what tenure risk is and offers objective evidence that the problem is widespread and of increasing frequency, as well as provides highlights from a real-world analysis of over 360 case studies. The Interlaken Group developed this Guide to support companies aiming to align their operations with the Voluntary Guidelines on the Responsible Governance of Tenure of Land, Fisheries and Forests in the Context of National Food Security.